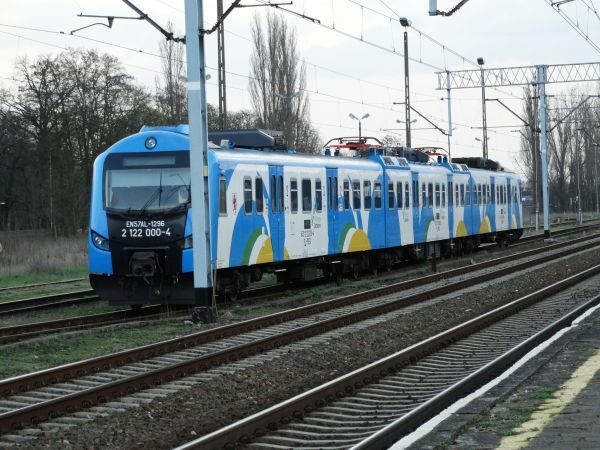 These are modernised type EN57 trains of Polregio, but here in the colours of the region Lubelskie, around the city of Lublin. Picture from Lukow 15.1.2018 by Timo Varshukov. 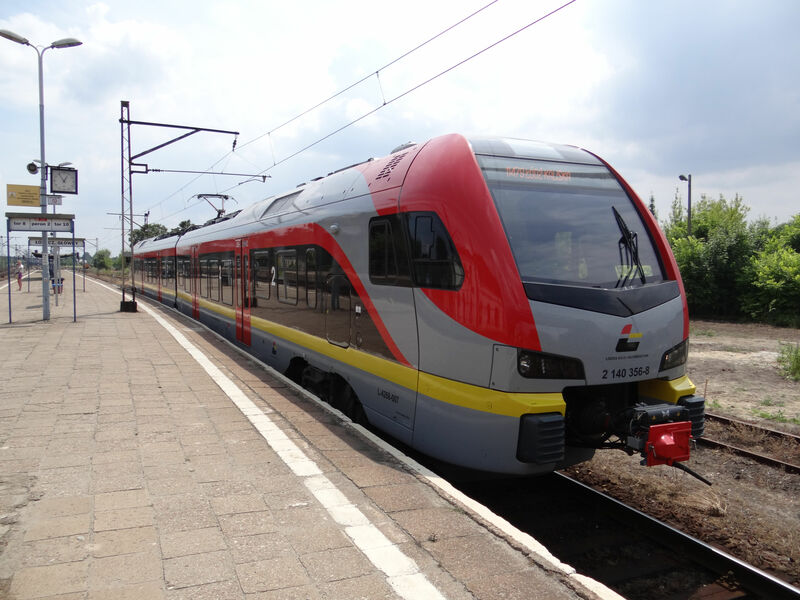 A similar modernised EN57 of Polregio Lubelskie like in the picture above. Picture from Terespol 15.1.2018 by Timo Varshukov. 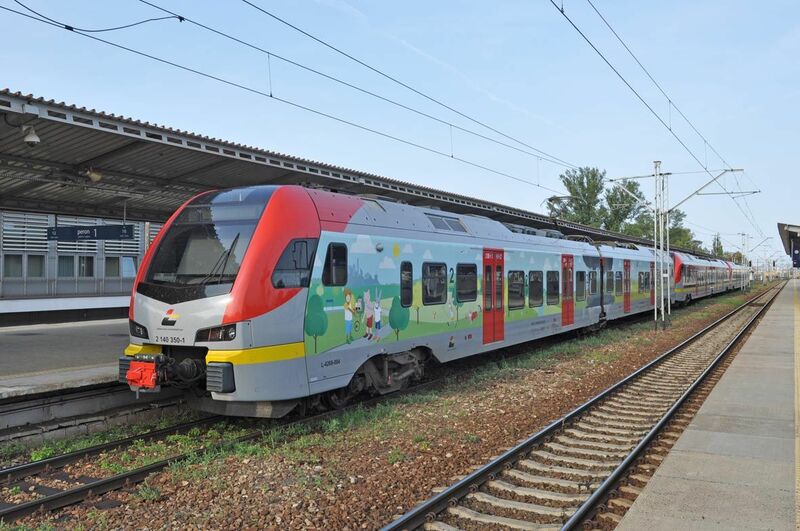 A brand new Koleje Masowiekie train of class EN76 "Elf" is stopping here at the station of Swiercze on its way to Warsaw. 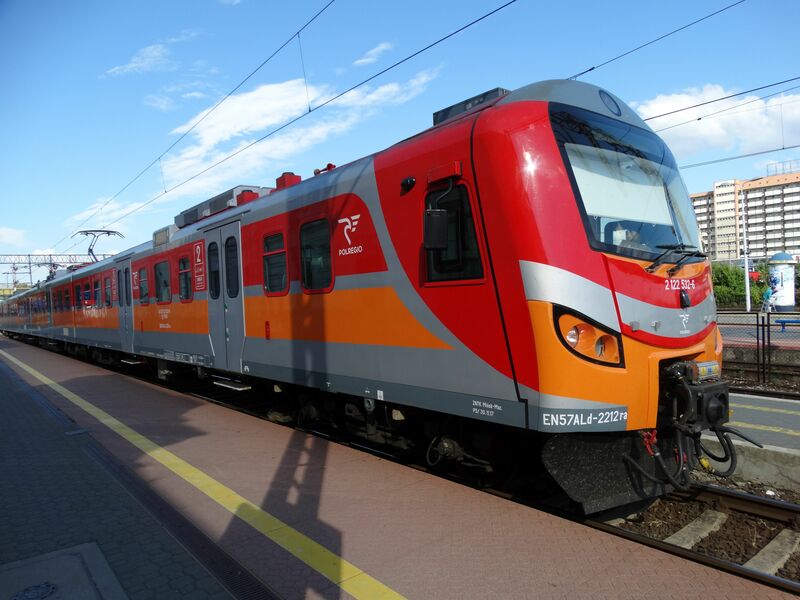 These "Elf" trains have been built by Pesa 2012-14 and KM has 16 of them. Note that there is another picture of this same train on the front page of this railpics.club picture archive. Picture in Swiercze 27.6.2015 by Ilkka Siissalo. Same "Elf" but seen from the side. Picture in Swiercze 27.6.2015 by Ilkka Siissalo. A third picture of the same EN76 "Elf" showing its total length. Picture in Swiercze 27.6.2015 by Ilkka Siissalo. 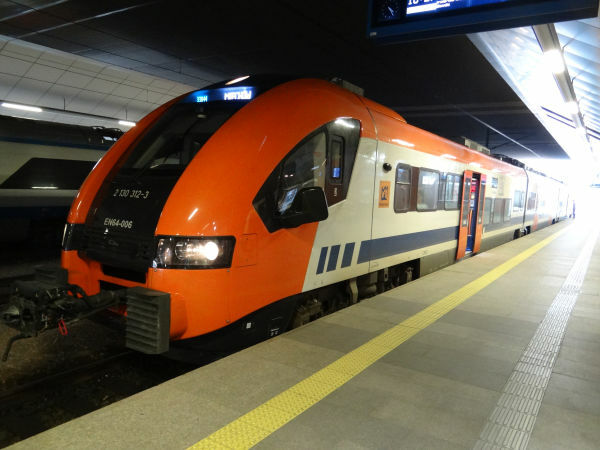 This is a Bombardier TRAXX locomotive of the second generation of TRAXX locomotives, built in Italy. In Poland they are known as locomotive type EU47. 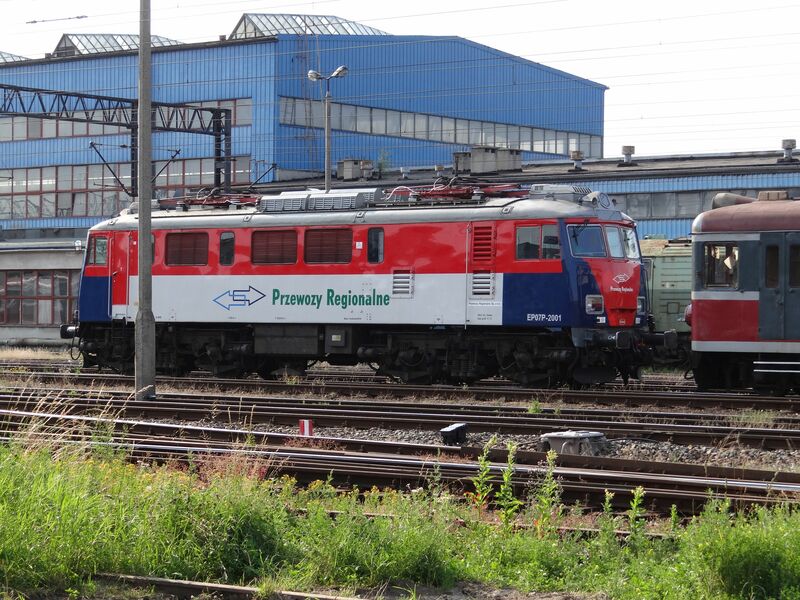 Masowian railways KM uses these new locomotives together with doubledecker rakes of coaches made also by Bombardier. They are mostly used in regional traffic around Warsaw. 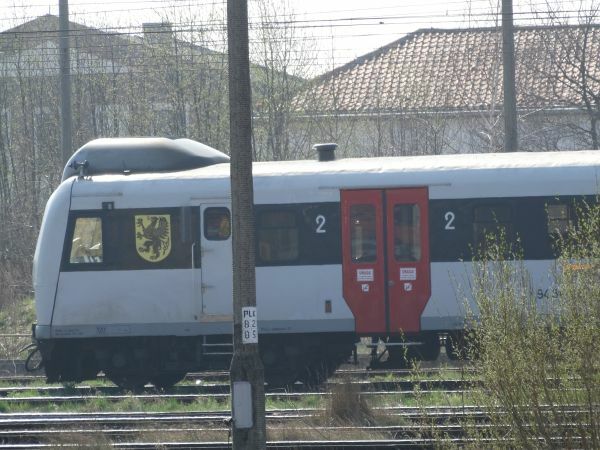 As trains they are very similar to what for example DB uses in regional traffic in Germany or also those of CFL of Luxembourg. Note that due to the relatively low voltage of 3 kV DC in Poland, also KM runs its locomotives with two pantographs up. A small sign at the side of the locomotive indicates that this machine can also be used in Italy as the Italian locomotive E.583 no. 001. Another sign gives credit to the European Union for partly financing the locomotive. Picture from Krakow Glowny 17.4.2016 by Ilkka Siissalo. 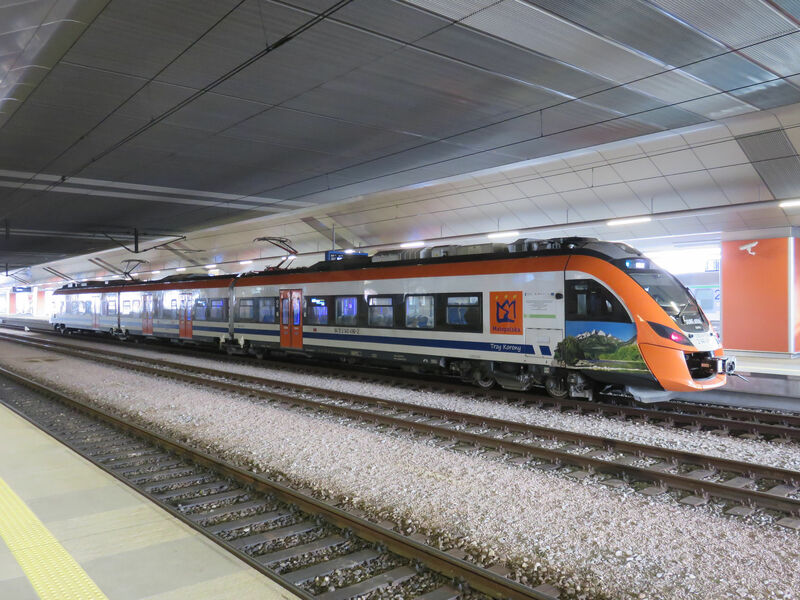 Another view of the same EU47 TRAXX2 no. 001 locomotive of KM. Picture from Krakow Glowny 17.4.2016 by Ilkka Siissalo. LKA, the regional train company around the city of Łódz is one of those few Polish train operators with all new trains. The company was founded only in 2010. It's a private company, but fully owned by Łódź Voivodeship government. 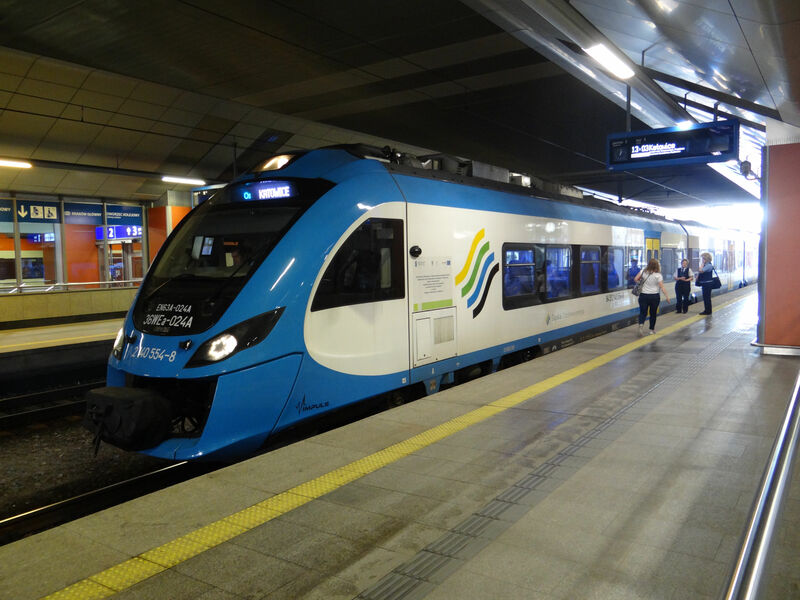 It operates five train lines using brand new Swiss Stadler 3rd generation FLIRT trains. This is one of the new FLIRTs, of which LKA owns 20 now. Picture from Lowicz station 28.6.2015 by Ilkka Siissalo. Another view of the same FLIRT3 of LKA. A long regional train composed of three two-coach FLIRT3 units of LKA. Same train as above, but seen from the other side. One of the FLIRT3 units had on its sides tapings depicting children playing in a park. The old class EN57 is still today probably Poland's most common electric multiple unit train. The regional train company SKM uses PKP's EN57 trains extensively in their traffic e.g. between Gdansk and Gdynia, but the trains are painted in SKM's colours. Picture of an SKM / PKP PolRegio's EN57 at Gdansk main station 4.4.2017 by Ilkka Siissalo. Also this is an old EN57, but now it has received a completely new drivers cab. The train is now designated EN57KM. Picture of an EN57KM at Gdansk main station 4.4.2017 by Ilkka Siissalo. 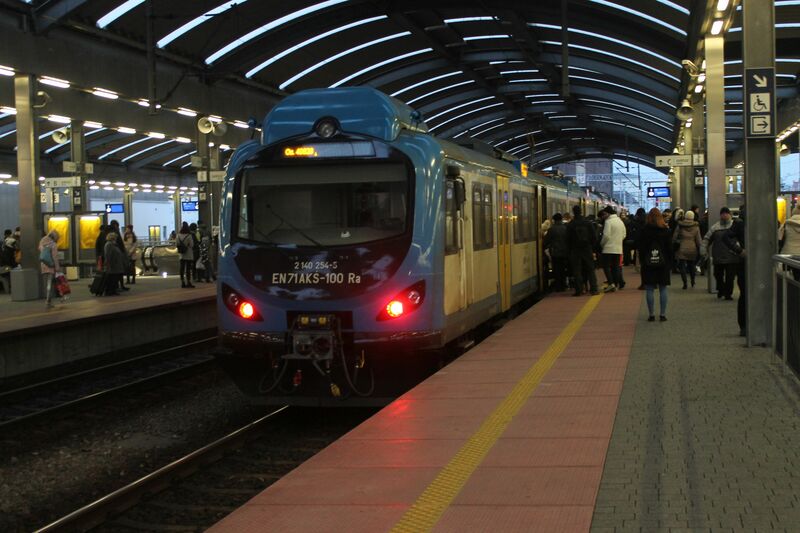 Same partly modernised EN57 as in the picture above, here loading passengers at Gdansk Glowny, Gdansk main station. 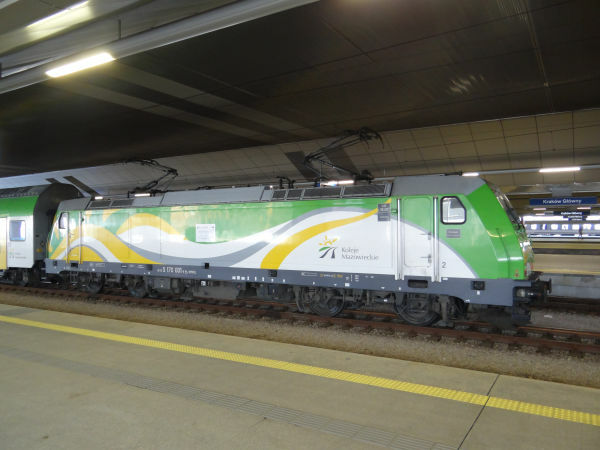 Picture of an EN57KM at Gdansk main station 4.4.2017 by Ilkka Siissalo. This is one of the tricky ones: It looks exactly like an old EN57 but it is actually one of the very first a bit newer EN71 models. Normally an EN71 looks much more modern, but these first ones were still similar to the earlier models. Picture of an SKM EN71 in Gdansk 27.12.2017 by Timo Varshukov. Another view of the same EN71 as in the picture above. 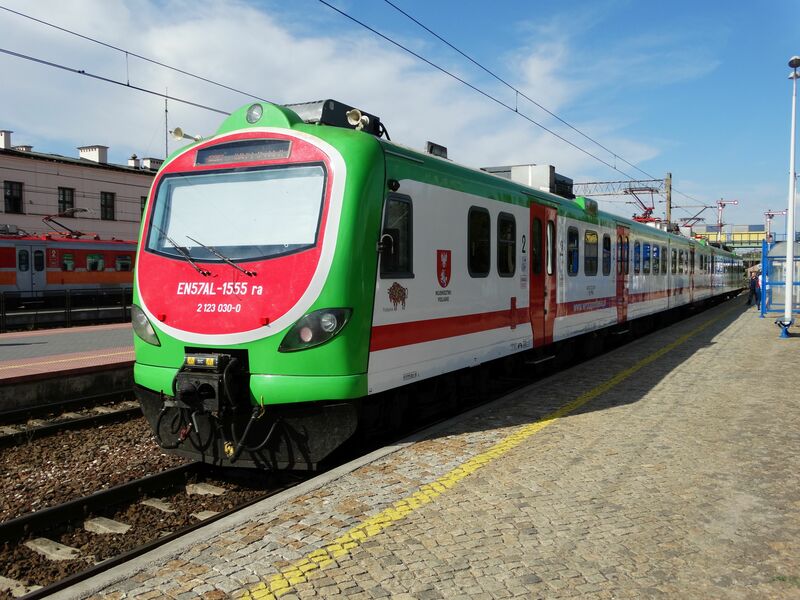 The trains of the Podlasian Vojvodeship carry the colours of the region, but the operator is the state railways subsidiary Polregio. This AN57AL is a very old EN57 train which has been really thoroughly modernised and has for example received new frontal parts and new doors. But basically it is still the same, old, noisy train from decades gone by. 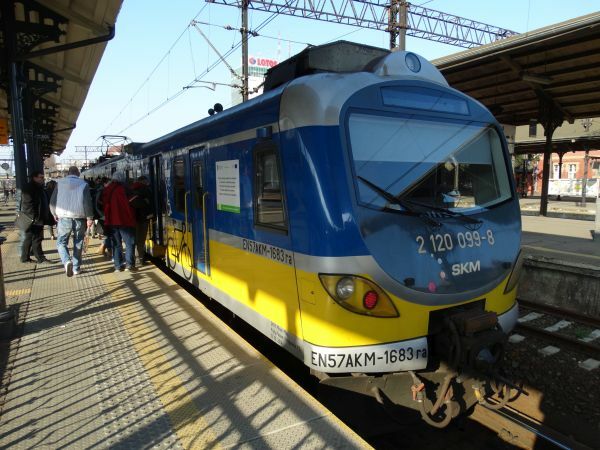 SKM stands for Szybka Kolej Miejska or fast city train. SKM of Warsaw is a totally another operator than the SKM of Gdansk-Gdynia. In Warsaw SKM has been operational as a company since 2004. It operates four lines, S1, S2, S3 and S9 in a similar manner than for example the S-Bahn trains of Germany. 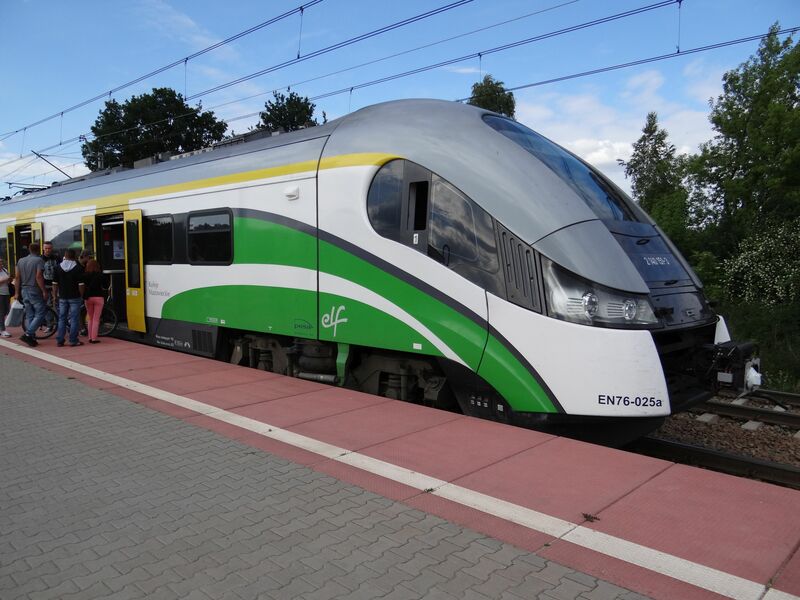 SKM in Warsaw has four kinds of trains and this one is the type 27WE also known as "Elf" made by the company Pesa. Elf stands for electric low floor. 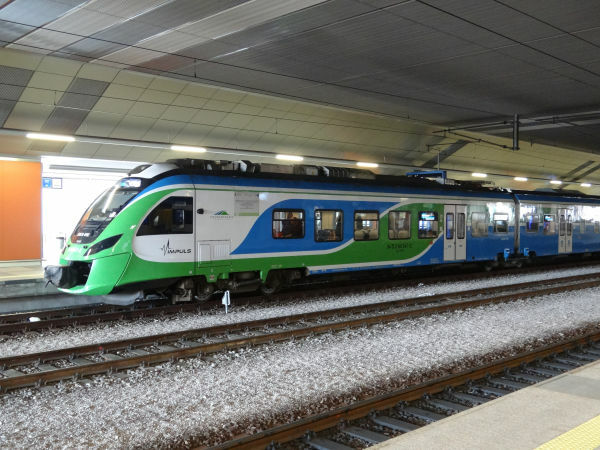 The first Elf trains entered service in 2011. 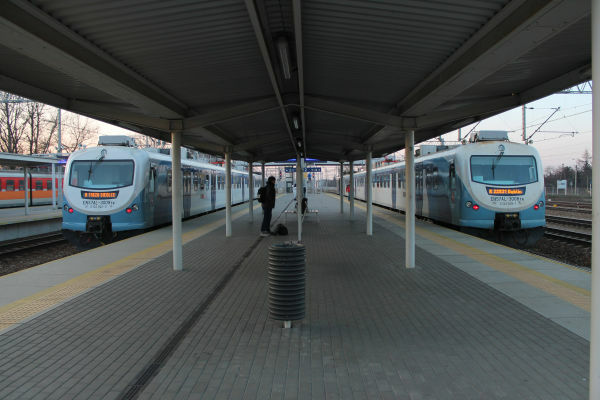 There are various versions, from two to six coaches depending on the configuration. 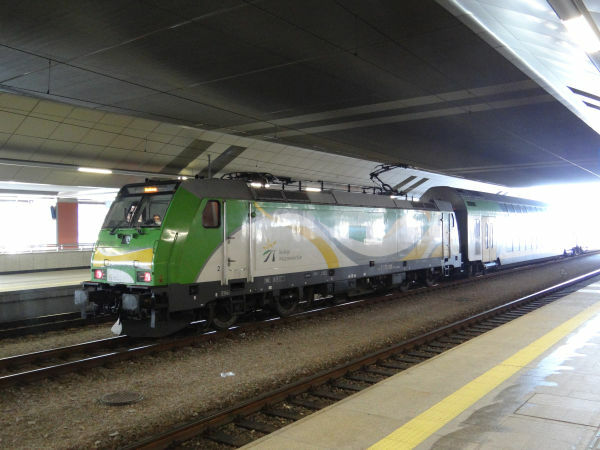 Some Elf trains can run on both 3 kV DC (as here) and on 25 kV AC. Again a very old but partly modernised EN57, now classed as EN57AL. This time in the colours of the Western Pomerania province. Picture from Stargard station 5.4.2017 by Ilkka Siissalo. 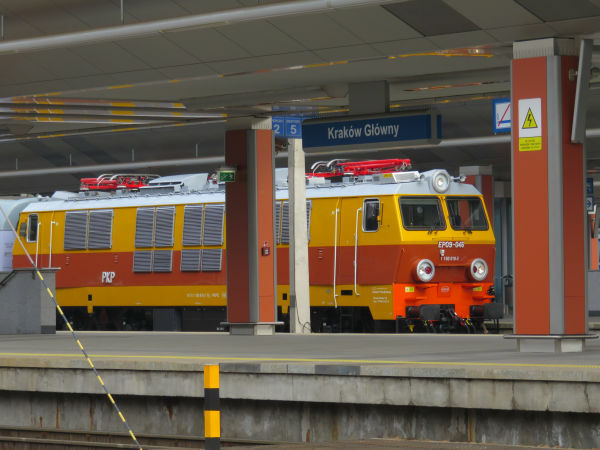 Two EN57 trains used by the trains of Western Pomerania. The one on the left is a similar partly modernised EN57AL than the one pictured above. 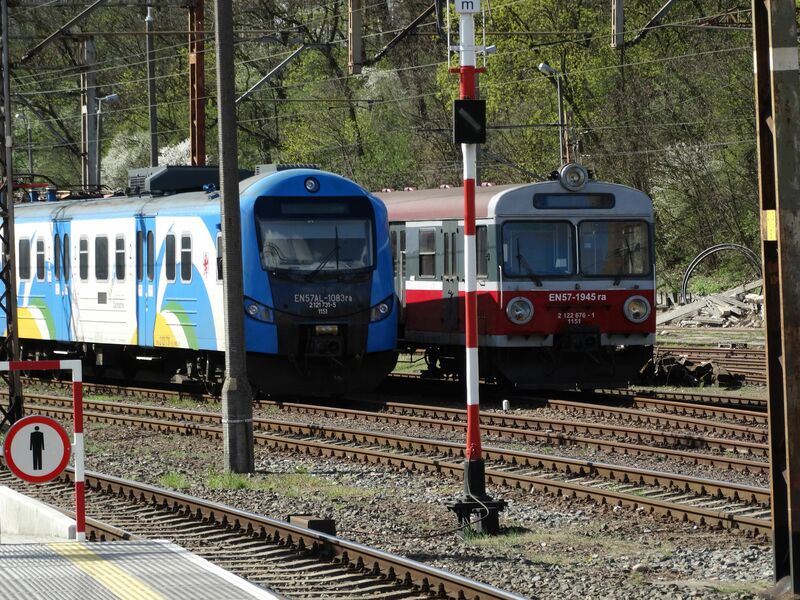 The one on the right is still in the old state railways PKP paintings, but what is odd there, the train has the front end of a newer model EN71 rather than the typical rounder face of an old EN57. 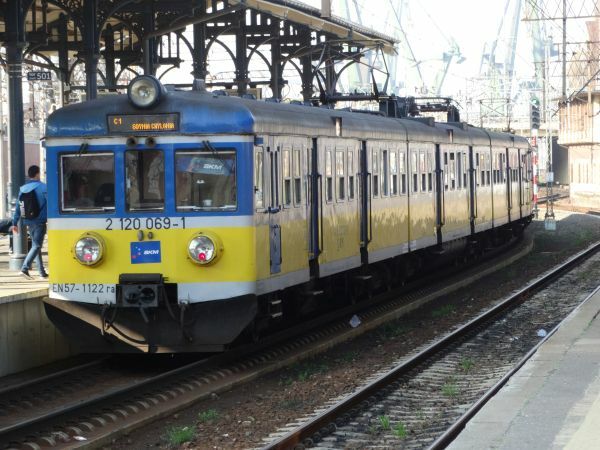 The model EN57 was in production 1962-1993, which probably is the longest period of time that any one EMU type has been in production anywhere in the world. This is one of the very last EN57s. Only the numbers 1900 to 1953 had this newer flat face and flat sides without corrugated side plates. Picture from Szczecin main station 6.4.2017 by Ilkka Siissalo. Still a couple of years ago the whole Poland seemed to be full of trains just like this, very old class EN57 electric multiple units. Now in 2017 many of them have already been partly or wholly modernised or scrapped, so that this original "state railways" painting scheme is gradually vanishing from Polish tracks. But this one is still one of the original. A huge number, totally 1412 units of these trains were built by Pafawag 1961-1993 with almost no changes. Picture in Korsze 3.4.2017 by Ilkka Siissalo. Sorry for the poor quality of the picture, it was taken over a high fence and from far away. 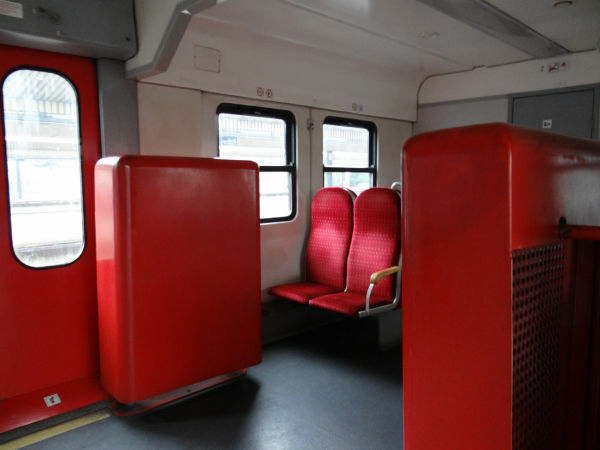 But this is an example of how the old EN57 trains have been partly modernised. This one has received new drivers cabs, apparently with air conditioning, and the doors and led panels are new. But the rest of the train is still the old EN57. Picture from close to the Elblag station 4.4.2017 by Ilkka Siissalo. Another old EN57 train which has been recently modernised and painted in the very newest livery of Polregio. After modernisation, this is now called class EN57ALd. Same train as above. The front part is all new and it has now air conditioning, which of course is a big plus, but other than that, it still is the same noisy train right from the 1950s. 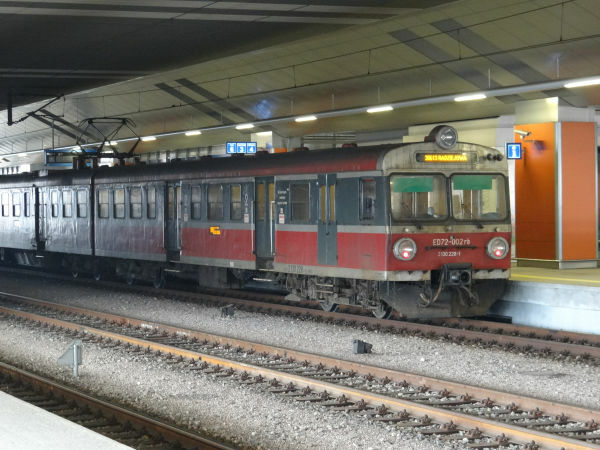 The text says that this is one of the newer type EN71 trains, but it looks exactly like the very old EN57s. A train to Tarnow from Krakow Glowny. Picture at Krakow Glowny 5.3.2015 by Ilkka Siissalo. Same EN71 as in the picture above. Pure socialist style. Picture at Krakow Glowny 5.3.2015 by Ilkka Siissalo. 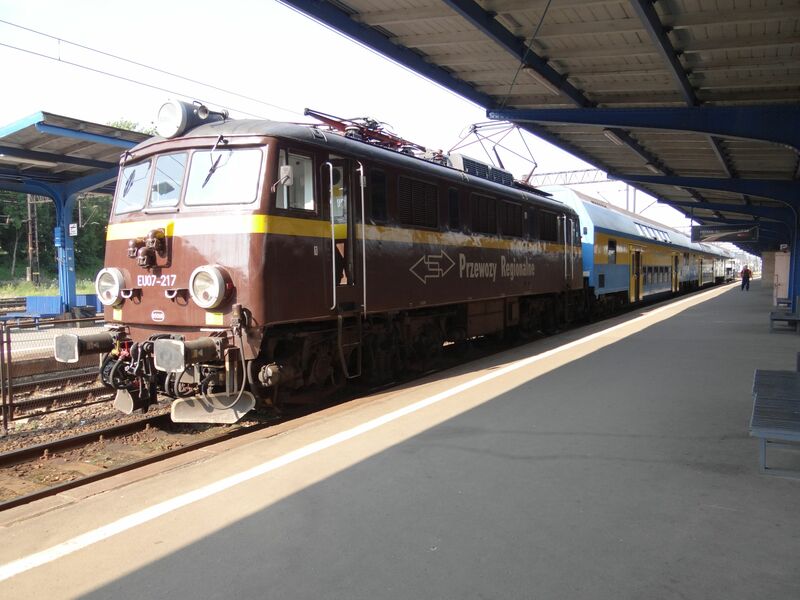 An old EN57, also on the route Krakow-Tarnow. This is one of those old EN57s which have smooth rather than sickled side walls, so this is one of the newer examples. Picture at Krakow Glowny 5.3.2015 by Ilkka Siissalo. 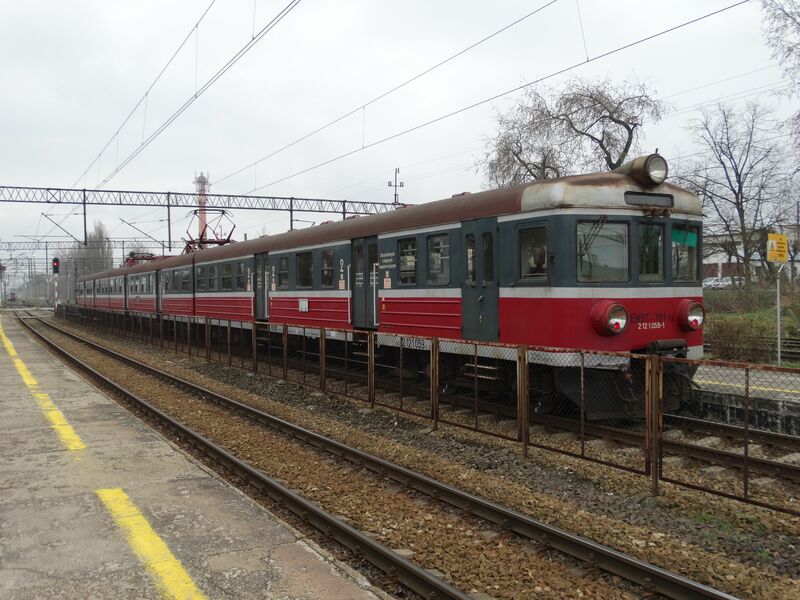 Also this one is one of the old smooth-walled EN57 trains, but one that has been partly modernised and has received new driver's cabs. 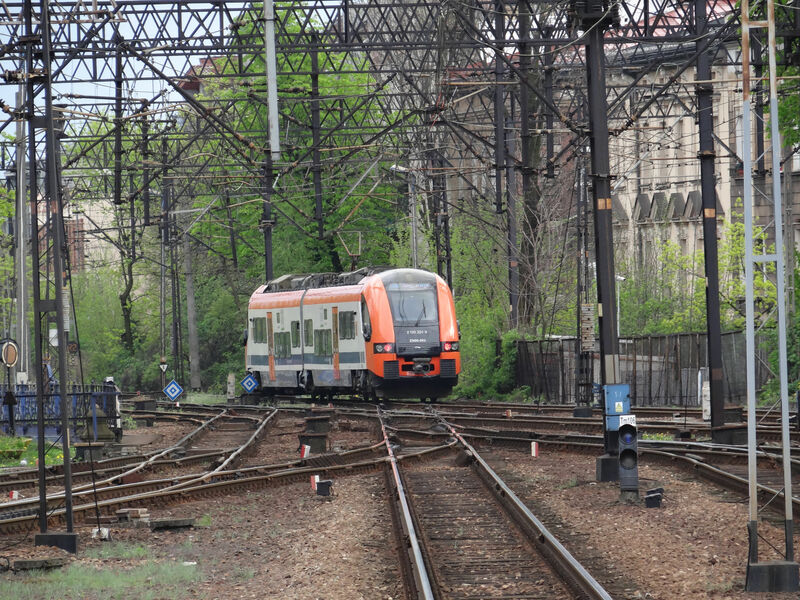 Picture from Czestochowa station 28.6.2015 by Ilkka Siissalo. 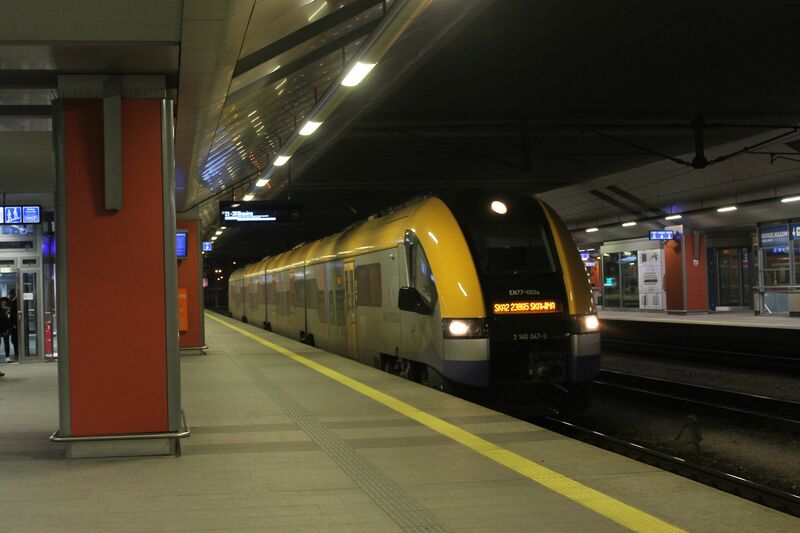 Same modernised EN57 train as in the picture above, but now seen in the inside. Also passengers have received new, comfortable chairs as well as air conditioning. ED72 is the little newer variant of the "omnipresent" EN57. It is a four car long EMU type constructed in 1976 by Pafawag. Top speed is 110 km/h and its power rating is 1160 kW. It has 264 or 288 seats depending on the variant. Picture at Krakow Glowny 5.3.2015 by Ilkka Siissalo. 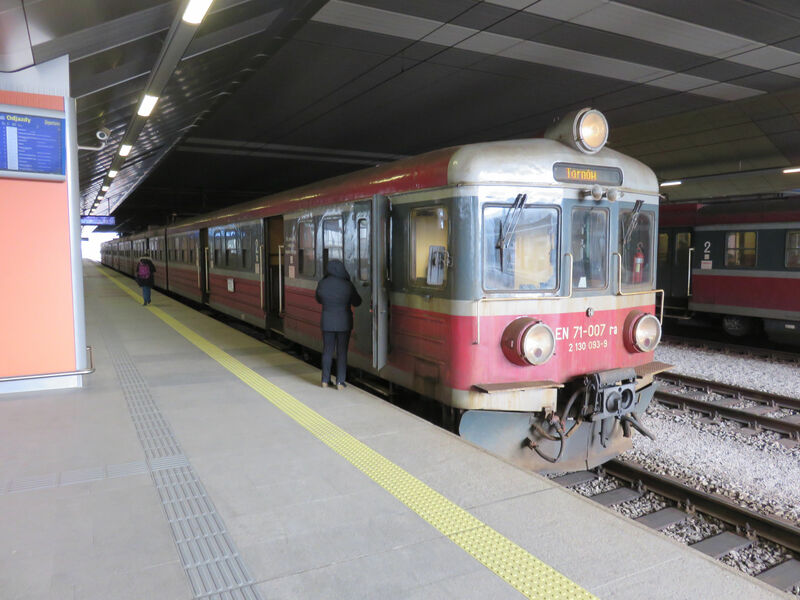 This looks like the newer EN71/ED72 but it actually is still the older EN57, but one of the very last EN57s made, which already got the newer design in its coaches. This is very typical of Poland. You cannot reliably recognise a train type by its looks, but will have to rely on the texts that it carries. 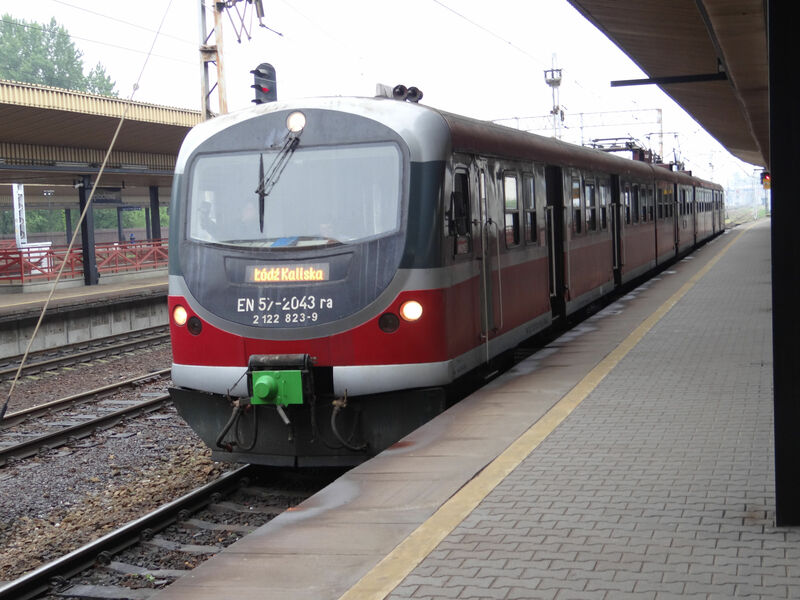 Picture of one of the very last series of EN57 trains of Polregio, taken at Olsztyn Glowny (Olsztyn main station) 29.6.2013 by Ilkka Siissalo. 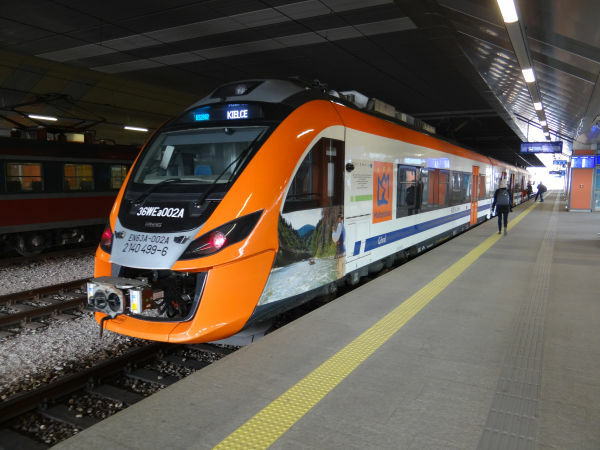 This is a new class EN63A electric multiple unit of Polregio, but here not in Polregio's own colours but in the colours of Przewoźnik kolejowy w podkarpackim, the regional railroads of the region Podkarpackie. The train is a Newag Impuls, a 160 km/h fast EMU. 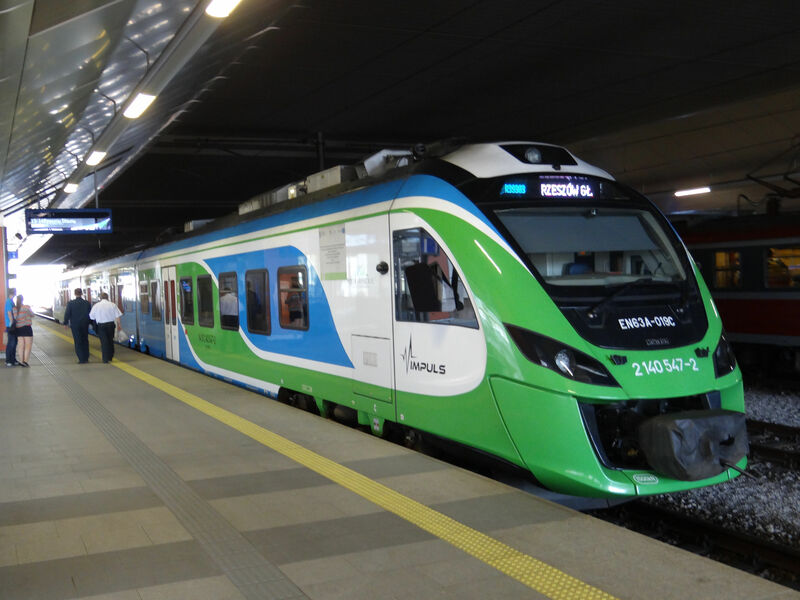 Województwo podkarpackie (Podkarpackian region) bought its very first Impuls in 2013 and these ones of the subtype 36WEa came in use in 2015. 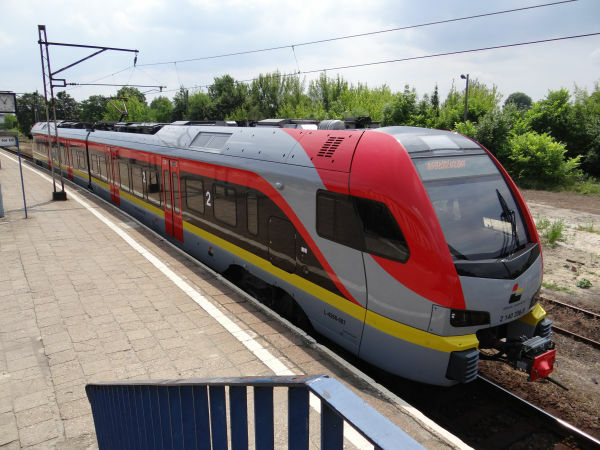 Here we see the train in Krakow, on the route Rzeszów – Kraków. Picture from Krakow Glowny 17.4.2016 by Ilkka Siissalo. A side view of the same Podkarpackian EN63A as above. Picture from Krakow Glowny 17.4.2016 by Ilkka Siissalo. Almost all of Poland's EU07/EP07 or EU09 electric locomotives are nowadays in the blue and white colours of PKP Intercity, but not quite. 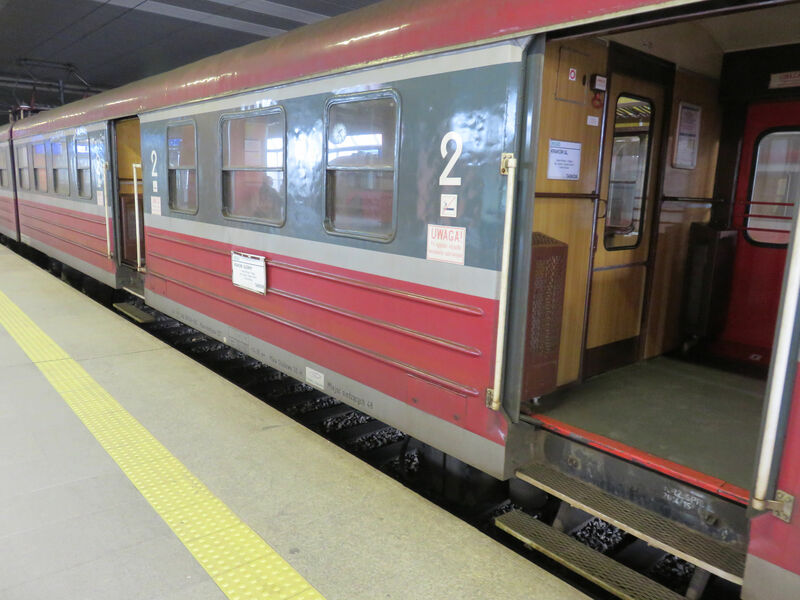 Some still carry the old green livery from the communist times and some, like this one carry varying brown and mustard yellow colours. 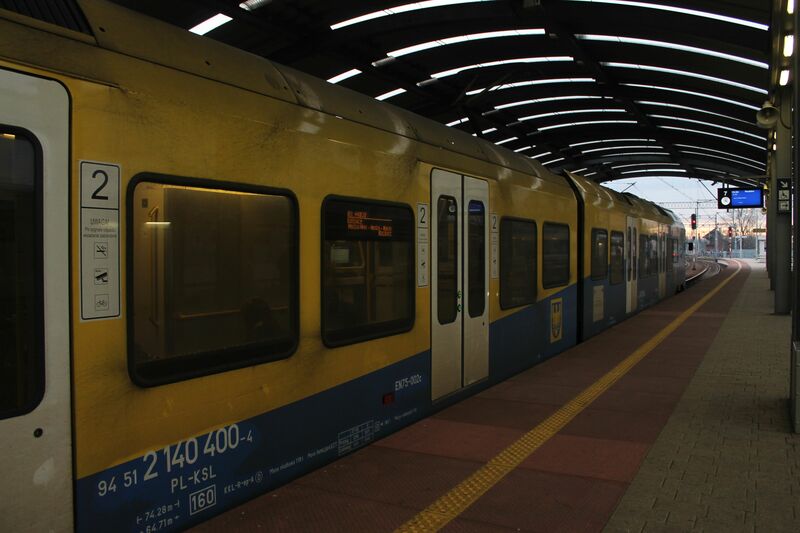 This one is now used by Polregio, whose previous name was Przewozy Regionalne (Regional trains). Here we see it leading a rake of old communist DDR time doubledecker coaches. 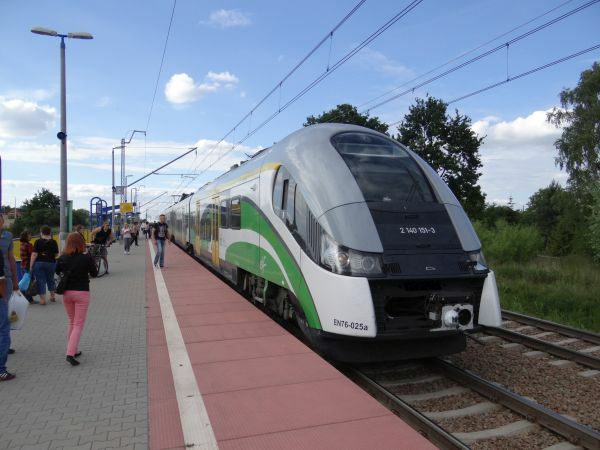 Picture from Olsztyn main station 29.6.2013 by Ilkka Siissalo. Here is an example of an EP09 locomotive painted in a mustard yellow + brown scheme sometimes used by Przewozy Regionalne / Polregio, but actually this machine was according to the tapings at its sides already swapped over to PKP Intercity. Picture from Krakow main station 17.4.2016 by Ilkka Siissalo. Yet again a very different painting scheme for a Polregio / Przewozy Regionalne EP07P. This is probably now the new "standard". Note also the modernised lamps. The EN63A is a three coach electric multiple unit built by the company Newag and seen here in the colours of SKA. 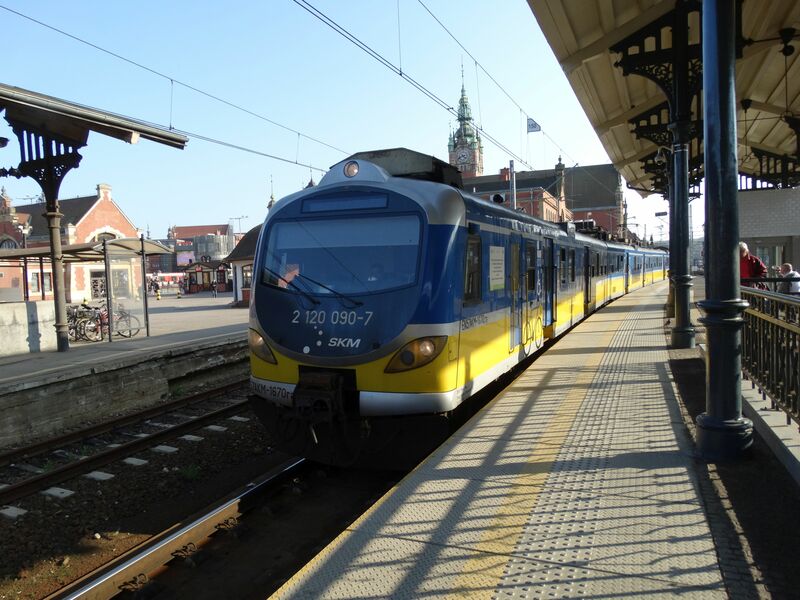 Picture at the Krakow Glowny (main station) 5.3.2015 by Ilkka Siissalo. 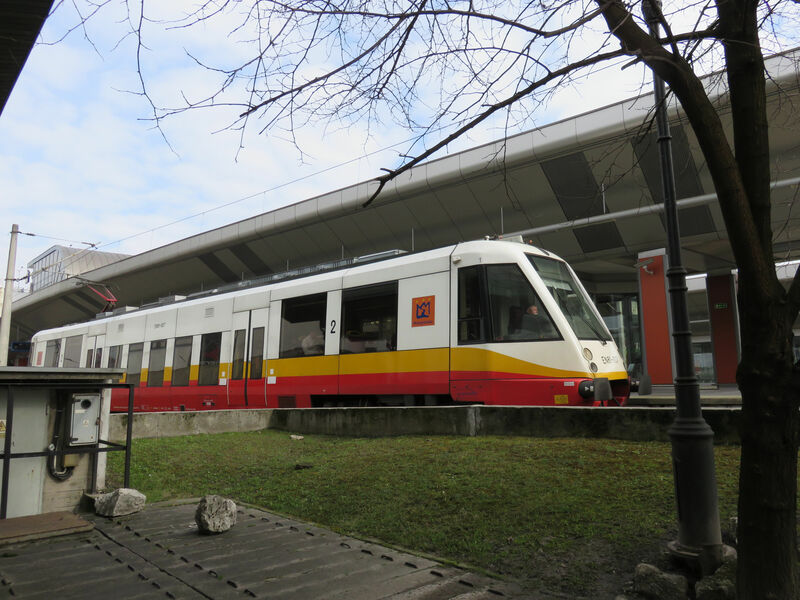 A similar EN63A of SKA at Krakow Glowny. 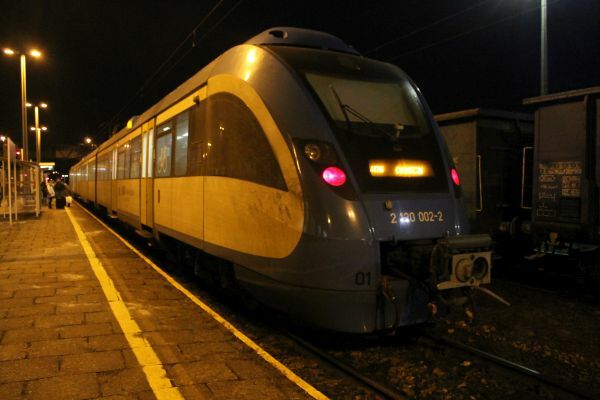 Picture at the Krakow Glowny (main station) 7.3.2015 by Ilkka Siissalo. 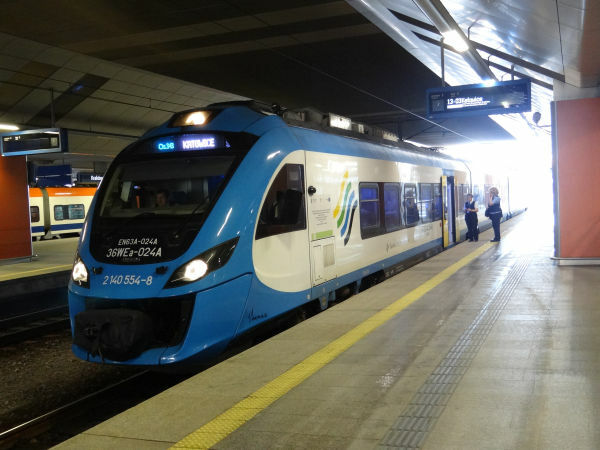 This is an EN64 electric multiple unit of SKA in Krakow. The type is made by the company Pesa and it is their internal type number 40WEa, also known as "Acatus Plus". 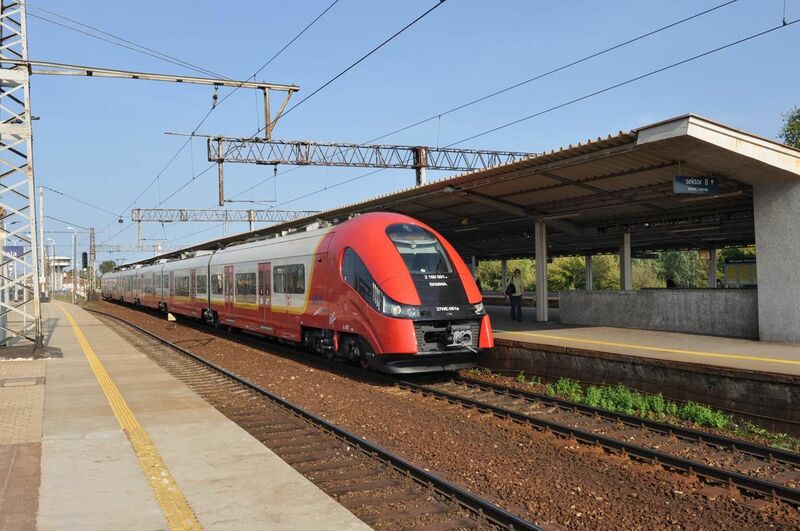 It is an 160 km/h fast EMU for 3 kV DC current, with 127 seats. They have been in use since 2014. Picture from Krakow Glowny 16.4.2016 by Ilkka Siissalo. 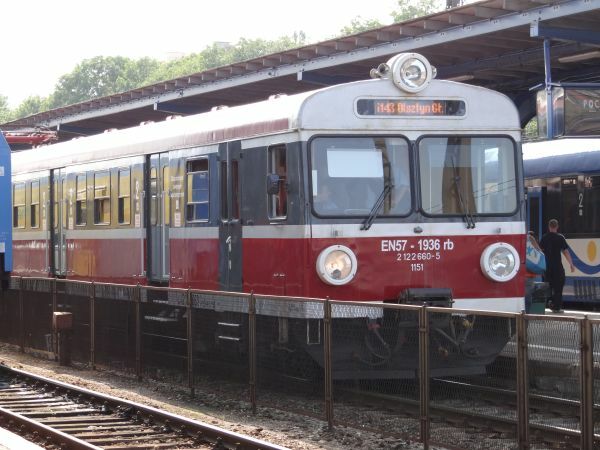 The type EN99 is a shorter, only two coaches long version of Pesa's "Acatus Plus". Pesa calls it type 41WE. It has 92 seats. Picture from Krakow Glowny 16.4.2016 by Ilkka Siissalo. The EN81 made by Pesa is a peculiar looking one coach electric train, partly low-floor. 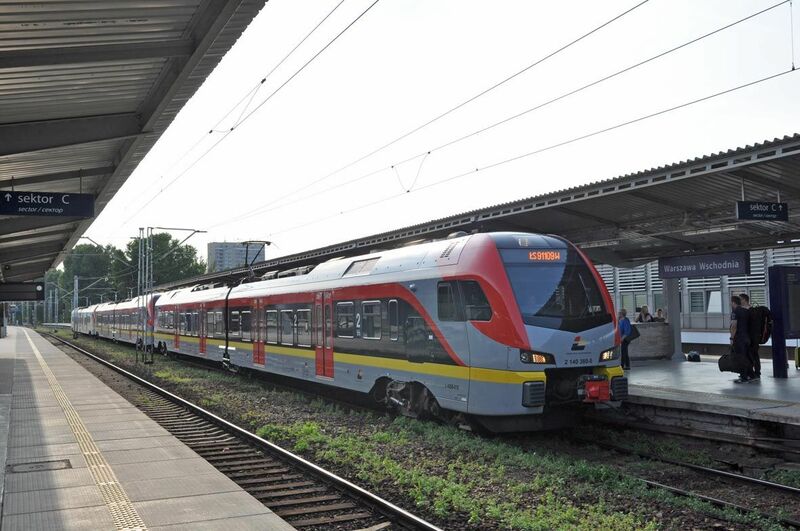 This one painted in the colours of the Malopolskie province is here leaving Krakow Glowny (main station) for a short run to the Krakow airport. Picture 5.3.2015 by Ilkka Siissalo. 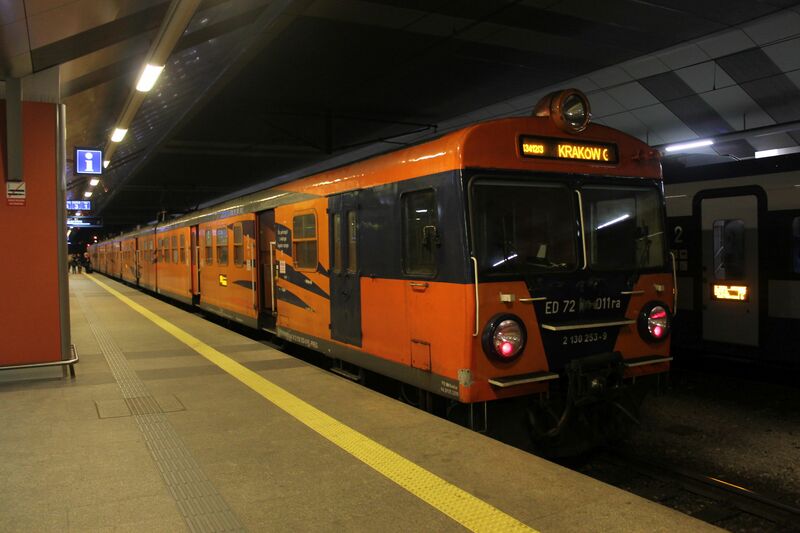 This EN77 is again an Acatus Plus from Pesa and used in the regional traffic around Krakow, just like the orange headed ones pictured above on this page, but now again the painting of the train is totally different. This is due to the trains changing owners rapidly. Picture from Krakow main station 28.12.2017 by Timo Varshukov. 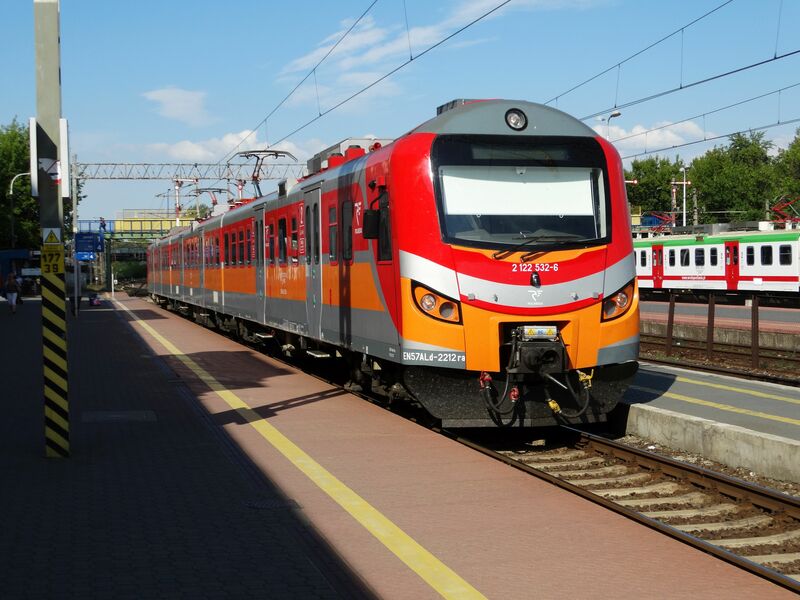 This is a Newag Impuls class EN63A of the subtype 36WEa of the Silesian Railways Koleje Śląskie, here ready to leave from Krakow Glowny towards Katowice. Picture from Krakow Glowny 17.4.2016 by Ilkka Siissalo. Another view of the same EN63A as in the picture above. The sticker at the side of the train says "Silesia - positive energy". A sticker at the side thanks the European Union for financing this train. Picture from Krakow Glowny 17.4.2016 by Ilkka Siissalo. Koleje Śląskie (Silesian Railways) has also Swiss Stadler FLIRT trains. This is one of their new FLIRTs. Picture at Katowice station 28.12.2017 by Timo Varshukov. 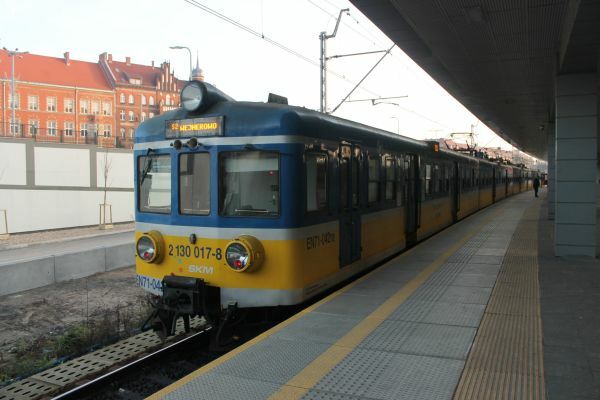 An old EN71 of Koleje Śląskie, but one that has been modernised and has received a totally new front part. 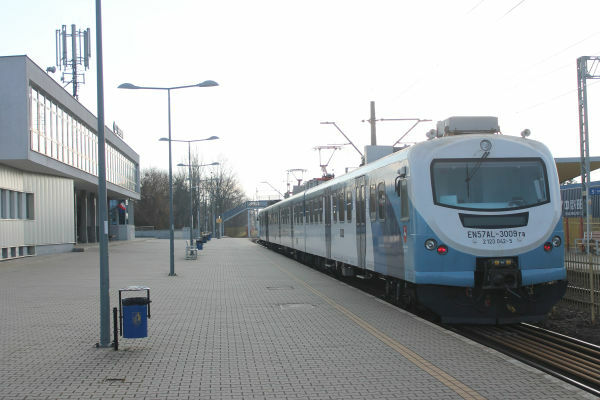 This one is a Newag 14WE, class EN61 of Koleje Śląskie. It's a three coach electric multiple unit built 2005-2007 by Newag in Nowy Sącz. 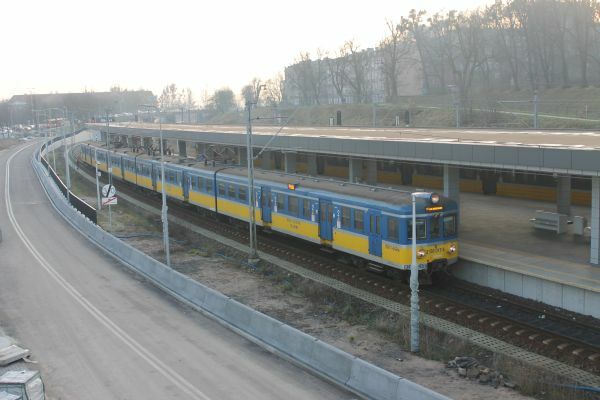 Newag built them for two operators, SKM of Warsaw and PP – Pociąg papieski. 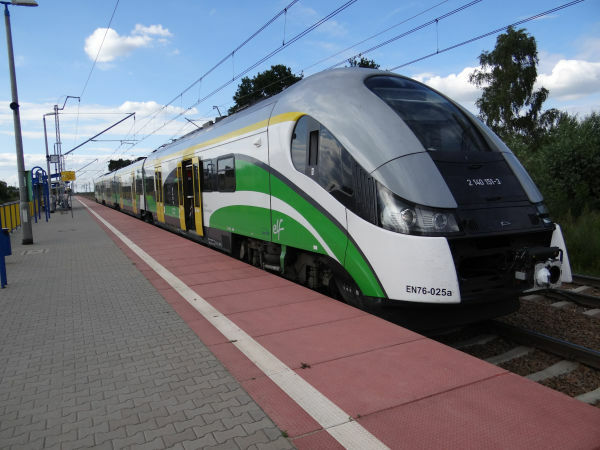 Silesian railways bought their trains used from SKM. 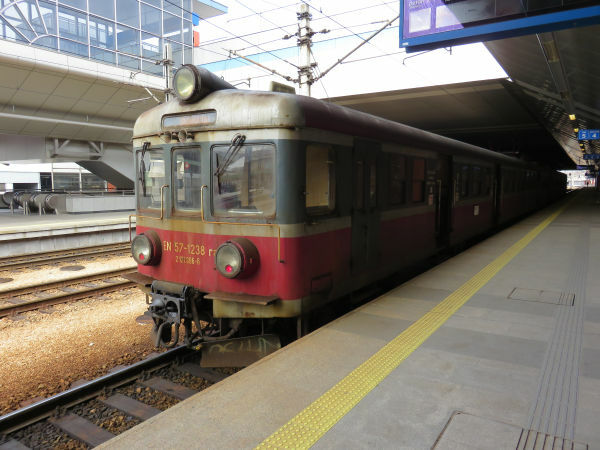 An old ED72 train of Polregio, but operating for Silesian railways and carrying its old colours. Picture at Krakow Glowny station 28.12.2017 by Timo Varshukov.